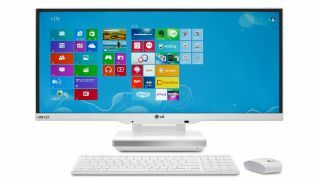 LG offers up a 21:9 all-in-one PC: fancy CinemaScoping up your desktop? LG has rolled out an all-in-one PC with a bit of a difference: it's all built around a 29-inch 21:9 ratio IPS screen. Last year's 21:9 monitor by LG has clearly sold well enough to prompt the Korean giant to create the 29MA73, an all-in-one with the same ultra-wide ratio. The company's latest offering is a Windows 8 toting PC that includes an Nvidia GeForce GT 640M GPU and can cope with picture-in-picture so you can watch TV through the built in tuner while performing other tasks. LG has also added a few more 21:9 monitors, all of which are Mac compatible and support Mobile High-Definition Link, HDMI and DisplayPort. The 21:9 ratio has enjoyed a burst of popularity in displays chiefly because it allows the showing of CinemaScope films - shot in 2.37:1. Philips famously produced a 21:9 television range, dropping the line due to a reported lack of sales, but more real estate on a computer monitor could well prove to be popular. LG's previous offering means that it will be well aware of demand, and the confidence in producing a wider range suggests that there is a desire for ultra-wide. We don't know price or even international availability yet but the new range will be on show at IFA 2013.